Even with the advent of portable devices and new form factors that have drastically changed the way we do business, desktop applications are still critical for many major business segments including imaging applications, graphics intensive applications, ERP systems, manufacturing & industrial automation systems, financial applications, medical applications, etc. Desktop applications characterize development with multiple technologies, complex object level hierarchies and customized controls. They require data interoperability with integrated systems demanding rigorous testing to ensure there aren’t any compromises with quality. Graphical user interface testing for validating the functionality and working of its GUI components. Business logic validation of the AUT functionalities by prioritizing test efforts by associating them first with high-risk modules, most customer complaint prone segments, high security and largest financial impacting segments. Installation & Deployment testing to check for clean installs, checking for registered & unregistered components (DLL), testing new services, user authentication, graceful quitting upon encountering interrupts, supporting clean reversible installation, correcting folder structure & location checks. System Integration testing of middleware and backend systems along with 3rd party components interacting with the hardware to ensure behavioral deviations are identified early. Upgrade testing and backward compatibility testing. Interoperability Testing to validate data communication & systems interaction. 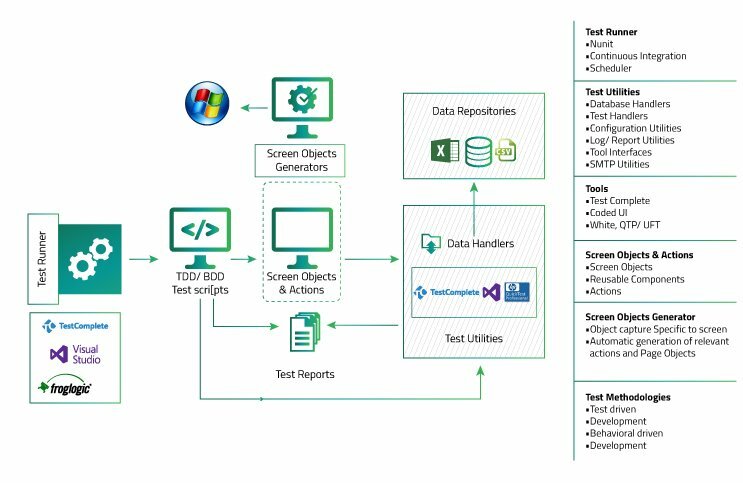 Migration testing of legacy applications to the next generation desktop applications towards the path of modernization. Performance testing to identify application bottlenecks & congestion points, analyze logs for application usage, check downtimes, load test monitoring etc. Run application Security scans across network and infrastructure, identify and assess platform vulnerabilities, recommend security control enhancements with remediation. Usability Testing of the most required application functionality to be easily accessible for application tasks to be performed faster, with more comfort and in lesser time.